The claims made for Pilates’ benefits are myriad – it is astonishing that it can, apparently, offer the wide array of outcomes that one can read about on the web. Before I give the wrong impression, let me be very clear (again) that I’m an enthusiastic advocate of Pilates, and have both personal and professional experience of the remarkable changes it can help to make in many people’s lives. 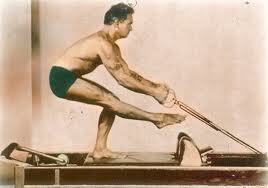 One website I visited contends both that Pilates can help prevent osteoporosis, and that it will not stress joints. (Perhaps I’m wilfully misinterpreting, but surely stress is what promotes bone growth…?) This seems to relate directly to what, I would contend, is a flaw in Pilates (as it is often offered to the public). How much time do people spend lying down, both in mat and equipment classes ? There are excellent reasons to spend some time in a Pilates class with the participants lying on their backs – using the floor as feedback for developing postural awareness, safely introducing loading of the trunk stabilisers, and introducing loaded hip extension, for example. Occasionally I set out to teach a mat class without any lying down, but generally speaking any mat class I teach will involve a bit, for those reasons above, and a few others. At the same time, many mat classes seem to incorporate a lot of lying down, and I’ve come across many people who are regulars at a Pilates studio and in the habit of spending 45 minutes of a 75 minute class lying on their backs (maybe a foam roll too, for variety..), before then moving to the reformer to do more…lying on their backs. The trouble with lying down is that it’s not a very useful position from the point of view of affecting adaptation, since we can’t do much in the way of stressing bones, muscles etc. If, for example, someone is quite kyphotic, or has protracted shoulders, they may be able to find a better position, with the help of gravity, whilst lying down. What happens when they stand up? If we are to help people understand and maintain good/ideal/optimal (or insert your own referred adjective) upright posture then we need to teach them in upright positions. Just as you’re unlikely to improve your running technique by practicing swimming, you’re unlikely to get better at sitting or standing upright by practicing lying down. Similarly, whilst we can lay the foundation for trunk stability in a supine position, we can’t help people learn how to be robust to changing loads/forces on their trunk when they’re standing unless we teach exercises that involve them standing. We cannot help people to move efficiently (safely, with confidence etc.) against gravity in the outside world if we don’t incorporate standing or sitting work in Pilates classes. Very intersting, but waht doe you think of pelvic rock exercise for example. We can perform the pelvic rock on standing, lie down, on force …Don’t you agree that pelvic rock onlie down on the back help to promote proprioception? Thanks Chris, I appreciate your feedback.